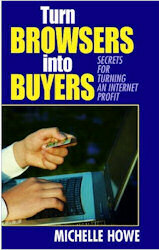 Michelle Howe, MBA, owner of Internet Word Magic, is an expert in search engine optimized copywriting for websites and the author of the award winning book, Turn Browsers into Buyers: Secrets for Turning an Internet Profit. She consults with companies to assist them in effectively positioning their online marketing message to match their offline branding. Her E-Mail Productivity System training is a customized training program that covers the issues of business writing, e-mail etiquette, e-mail security and the liabilities of e-mail.